. 1 Comment Tags: 10 years, anniversary, etsy. I remembered in addition to the opening shop date on Etsy shop pages, there was a place on Etsy’s profile page that states when you started on Etsy. Yesterday I decided to double check and see when I first created my etsy account, and boy am I glad that I did! Turns out it was the very next day, October 8th, TODAY! In celebration of being on ETSY for 10 YEARS, I’ve decided to take a little walk down Etsy Memory Lane. Picture it, the Summer of 2005. I was most definitely listening to some Weezer and Jack Johnson. I was also obsessed with the internet (still am) and hearing a buzz all over the craft blogosphere (read, LiveJournal) about this website Etsy. It was a brand new e-commerce site, similar to ebay, but where you could sell your handmade items. I IMMEDIATELY wanted to to sign up, but was also afraid. I was also unsure if this was a legit thing, or some sort of scam. I mean, I’d have to enter my credit card information online, eeeeep! If you signed up right away (if I remember correctly) there was an introductory period where you could list items for free. It took me a few months to realize this was sticking around and was for real. I created my account on October 8th and my account was something like #4885, meaning I was in the first 5,000 people to create an etsy account. Years later I was VERY PROUD of that fact and that my shop profile url page had that number in it. While our account numbers are no longer associated with etsy accounts, I was and still am OLD SCHOOL! I knew that if I wanted to start selling I should probably test out the waters first as a buyer and see how transactions go. 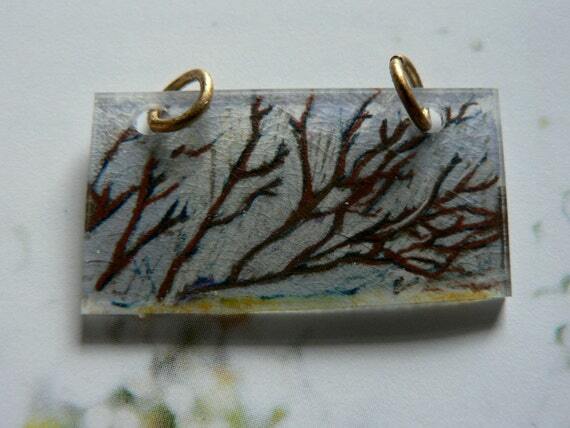 My first purchase was this pendent by artist Jenny Vorwaller whom I followed on flickr at the time. I still love the necklace but only wear it rarely now because I’m afraid that it was starting to wear down the colors. I actually don’t remember what my first listing was, but I had a variety of items in my shop from the get go. Stationery sets, original artwork and quilted framed yoyo pieces. All items that are still in my shop (in some form or another) to this very day! 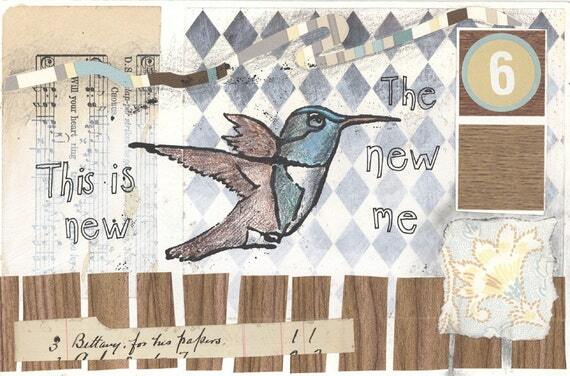 I’m very proud to say when you go back to my first sales, 1. my first sale was a piece of artwork (this mailart postcard to be specific) and 2. that I never went through that awkward phase where I was selling random things that weren’t representative of myself or my shop. More often than not when you go to shops you’ll find that they started out selling things that look nothing like what they evolved into. Maybe that means I haven’t grown? I hope not. What HAS CHANGED a lot over those years is Etsy. It has gone from this tiny community to this BIG deal that went Public earlier this year. With the introduction of Facebook Memories this year I have been SHOCKED to see how many times I mentioned that I was on Etsy’s front page, literally a dozen or more times. If you had asked me before seeing those memories, I would have said I probably got on the front page once or twice. The front page used to be first items picked by Etsy administrators, then curated Treasuries by Etsy users and now it’s just customized by each user, showing items from your favorites and shops and items they think you would like. I miss the days of chat rooms, where administrators would come in and give one on one critiques to shops. I remember the first year when I averaged a sale a week, followed by 2 sales and then 3 sales a week. In recent years I’ve let my shop slide a little bit, meanwhile Etsy was making major changes to how shops and items are found via SEO. In the last month or two I have really been digging back in and trying to dust things off and make updates. Not only are there about 1.5 MILLION active shops, the quality and caliber of items on Etsy is amazing now too. I remember getting compliments on my photography by Etsy admin back in the day. Now? I compare my pictures to other etsy shops and I can see why my shop is lost in the sea. If I was just finding out about Etsy now, I think I would be wayyyyy too intimidated to even try. I am so thankful that I was there in the beginning when we were all just trying to figure things out together. Etsy opened a BIG HUGE door to me. I’ve said it before and I’ll say it again, I am forever thankful for the opportunity Etsy offered me. Before Etsy I made items to sell, but was too shy to even dream of doing a craft show. Having an online shop allowed me to share my things safely until I could grow enough courage to take things publicly and in person. It introduced me to people I consider dear friends today. It has also opened the door to wholesale and consignment too. It was because of Etsy I was offered opportunities to sell my items at events, in stores on the opposite side of the world, to be featured on HUGE websites and even have my product on cable TV! My actual shop anniversary date is not until May 1st, 2006, so I’m sure I will be back again with another post then, and hopefully even some fun sales and events leading up to the date. Meanwhile, feel free to check out my shop now. See anything you like? Ahh, you have me beat by a couple years. 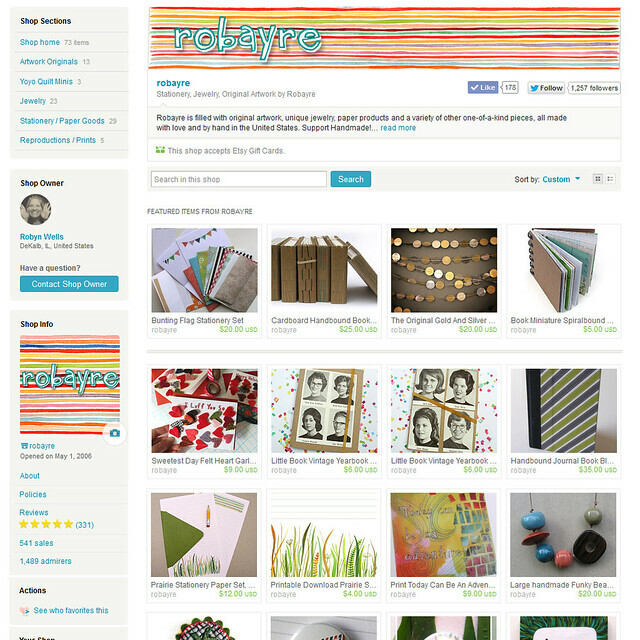 I joined Etsy (mostly as a buyer) on August 18, 2007. I wish etsy still used the same user IDs. I’m looking that the raw HTML of both our pages, and I see you are now #5117969. I’m #5264800. They must have reordered their index at some point. I wanna see what my original number was.